Sheldon Yett is UNICEF’s Representative in the Pacific, in charge of overseeing operations in 14 Pacific countries, including the Republic of the Marshall Islands, and the Federated States of Micronesia. 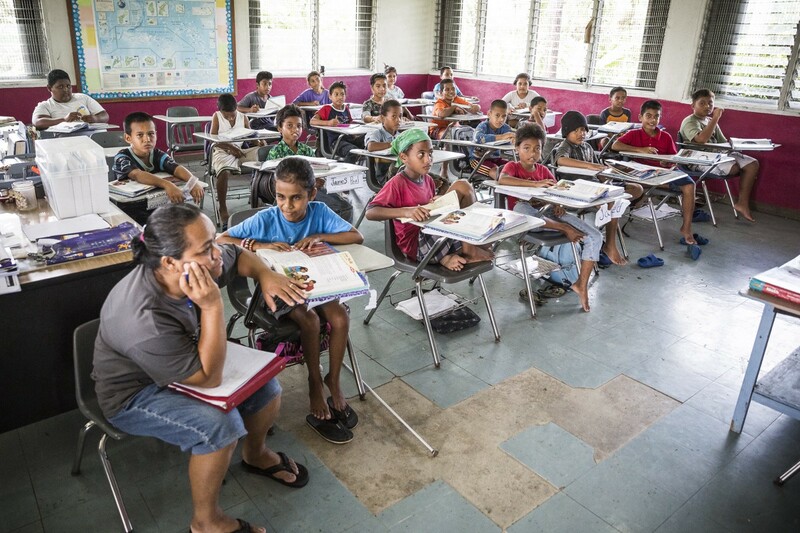 These small island states in the Northern Pacific are remote, and their inhabitants, including many children, have been missing out on the attention they deserve. He spoke to UNICEF NZ about how they can be helped. Like many Pacific countries, the Marshall Islands and the Federated States of Micronesia are made up of many small islands linked together under common flags. Those islands are very different, with diverse geologies, populations and cultures. 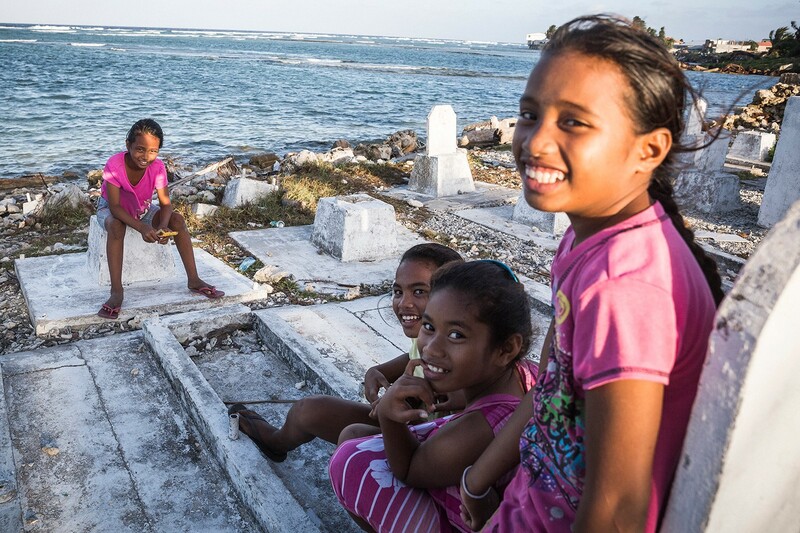 Like most of the Pacific, RMI and FSM are threatened by climate change. However, what they have in common is that the people are warm, welcoming, and genuine, and the islands are typically beautiful with palm trees, clear waters, and white sandy beaches. 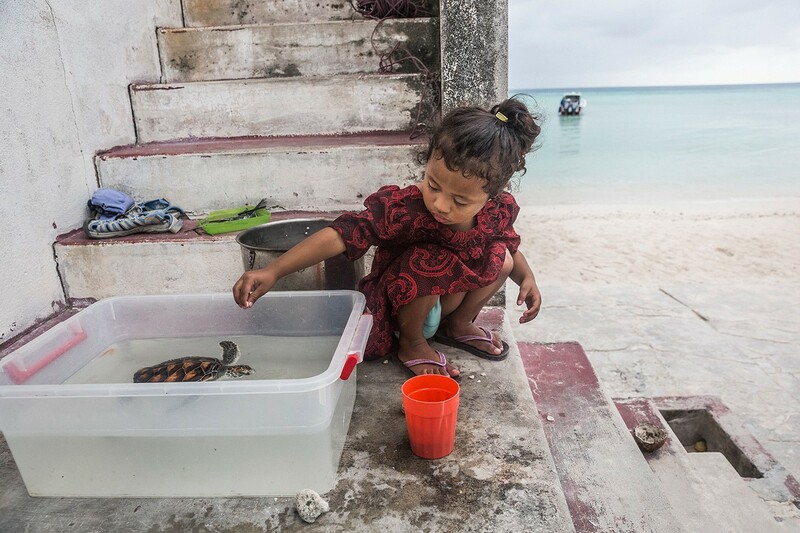 White sand beaches are wonderful, but they obscure the problems the island inhabitants face. They hide what goes on with children who aren’t receiving the education, or have access to health and nutrition they require or benefit from essential water and sanitation services. Too many calories, and too few calories — both issues are there. Because they are spread over thousands of square miles of ocean, they’re very remote. These countries are very rarely on the front pages of the world’s newspapers, but the problems are there, the problems remain. Rosie (front left) helps her daughter Grace, who was born blind, with her schooling, writing out her lessons in braille. Despite their relatively small size, infrastructure remains a problem. I was struck by just how difficult it is to get things done — getting supplies, services to rural areas. For example getting teachers to outer islands remains very difficult. Measuring progress remains difficult because, frankly, we have very limited data to start with. Some of the issues are similar — both suffer high rates of violence against children. Water, sanitation and hygiene is a critical and existential issue in both countries. 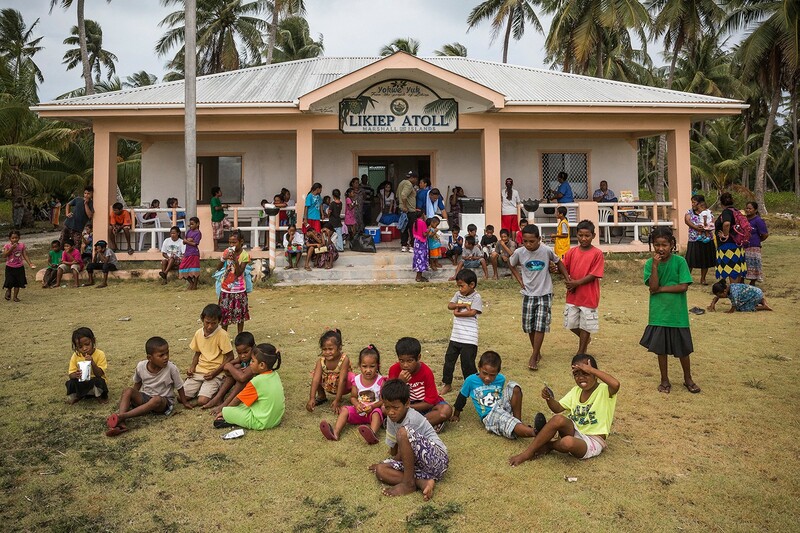 Their remoteness means logistics are challenging and communication remains a serious bottleneck. Both countries face growing problems with over-nutrition and under-nutrition. 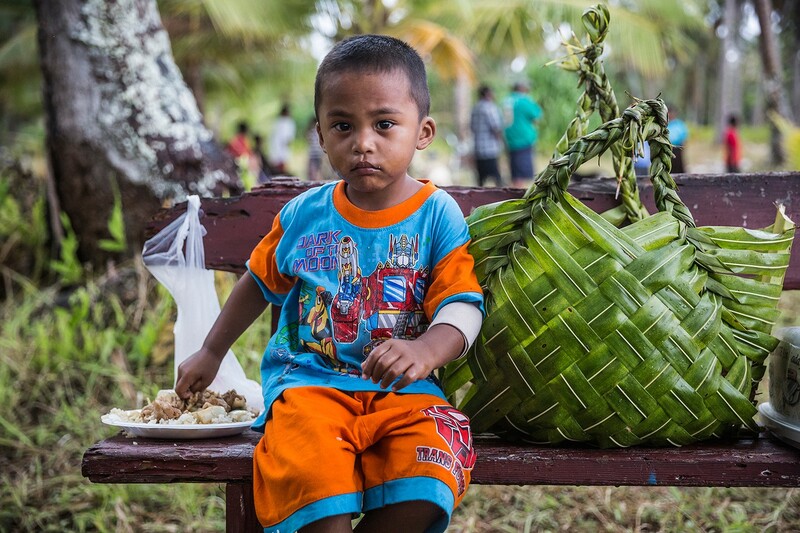 Four-year-old Ethan, eating near a building where teams from Majuro Hospital immunise children. 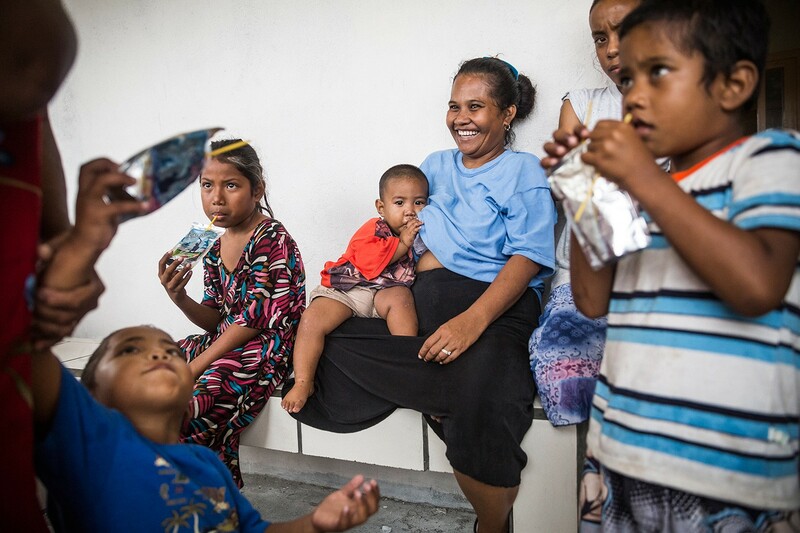 It’s quite common across the Pacific to see people who aren’t getting the nutrition they require. In RMI and FSM many diets are high in carbohydrates, fats and salt thanks to fatty junk foods from the USA, Philippines, and China. That’s fine if you’re spending your time rowing in the seas and fishing in open waters, but as populations become more sedentary it’s very damaging — leading to high rates of diabetes and disability. We’d be deceiving ourselves if we thought these deep-rooted problems can change overnight. They won’t. At the other end we have people who aren’t getting enough basic nutrition at all. Stunting is a growing problem, particularly in isolated and rural populations where people are just not getting enough in the way of basic calories. Lifestyles have changed. Where these populations once lived off the land and sea, they’ve grown more sedentary as convenience foods have become available, and of course physiology doesn’t change as fast as lifestyles. And that’s had a horrible effect on many people. That’s a dangerous recipe for children and young people. Statistics are just numbers on a page — but when you meet a child or a mother who’s had access to life-saving vaccines, that makes all the difference in the world. We’d be deceiving ourselves if we thought these deep-rooted problems can change overnight. They won’t. It takes working with leaders, patience and good measurement, so we know what’s working. There’s so much work to do, in so many areas. I don’t think there’s a country in the Pacific that is immune from climate change, so the same issues — larger and bigger storms, typhoons in areas that traditionally didn’t have typhoons — apply to these countries as well. All the problems of climate change that are affecting the southern Pacific are affecting the northern Pacific too. 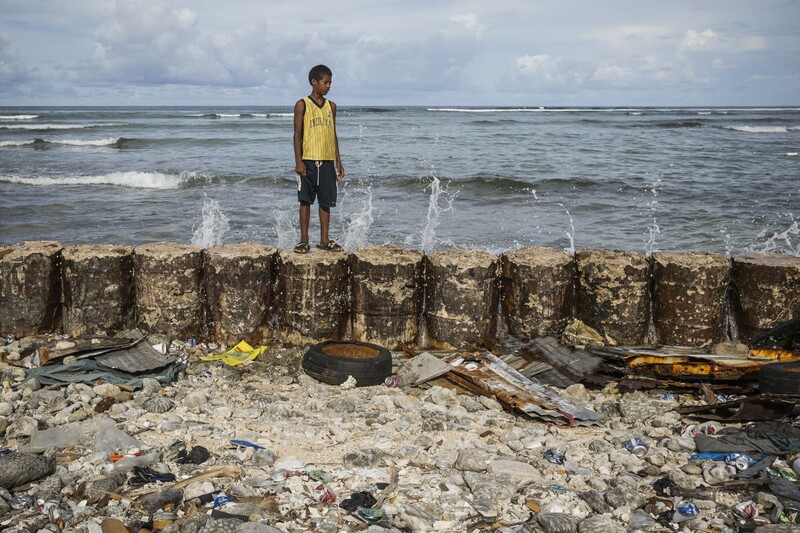 Frank, 13, stands on a seawall that protects his family home from rising seas on Majuro Atoll, in the Marshall Islands. So, we need to ensure that construction standards are consistent with the likelihood of bigger and more frequent storms, and that appropriate hygiene and sanitation practices are in place to ensure that when we get a storm, people don’t get sick from diarrhoea and other diseases. We can’t just parachute in and expect to make a difference, we need to work with those people who are already there. We need to help people understand what to do and how to adapt, and to do that we need to be able to work with local leaders, church leaders, and traditional leaders. We need to prepare people now for the immense changes coming. But all that takes time, working with students and using schools to reach others in the community is a good way to start. Niniel, 3, holding her four-month-old sister Ramona. The good news is that we’re making a positive difference. When you get education or nutrition supplies to a school, or work with lawmakers to ensure policies and strategies are consistent with best practices, it’s very satisfying. We can’t just parachute in and expect to make a difference, we need to work with those people who are already there, and who are starting to make a difference for themselves. All of us need to work together to make sure these countries receive the support they require. They haven’t been at the forefront of people’s minds, but the needs remain and the needs are deep. 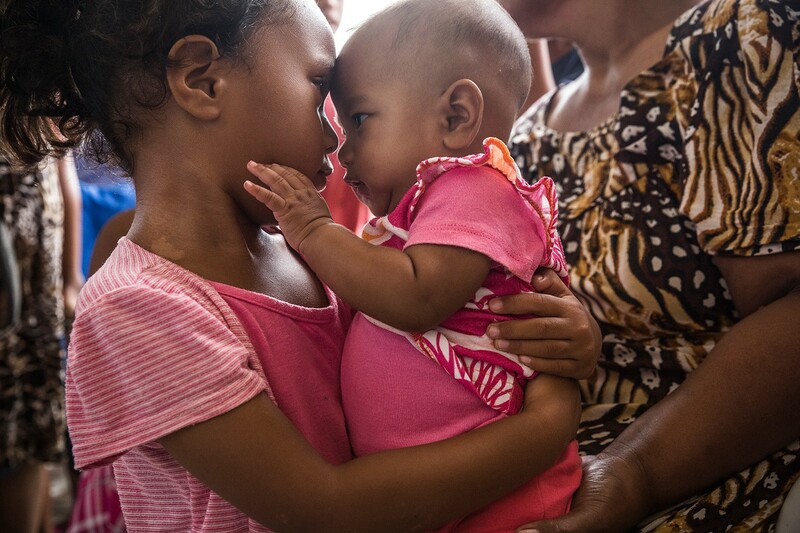 When you meet people whose lives have changed as a result of UNICEF’s work, it puts meaning to everything. Statistics are just numbers on a page — but when you meet a child or a mother who’s had access to life-saving vaccines, that makes all the difference in the world. It drives home why we need to spend the resources and make the effort to reach these communities. It’s not just about numbers — it’s about people’s lives.